There should have been just one Routegadget for all the courses, but I erred in the setup with the result that the blood races did not work correctly. Some runners had uploaded before I realised the problem. So I have re-named this first setup “for colour-coded courses” and runners on those individual start courses please use that setup. And I have created a second one “for blood races”, and runners on those mass-start courses please use that setup. I apologise to those on the blood races who tried to use the incorrect setup. Now it is setup right, I think watching a rerun of the blood races is a lovely way to occupy a few minutes. Do try it, and remember what the weather was like! Richmond Park features regularly in SLOW’s winter night series, however the chance to run full length courses in the daylight is a much rarer opportunity. I hope you enjoyed your runs despite the extremely testing conditions. Andy Robinson originally had the vision of holding the blood races in Richmond Park and he provided a wealth of knowledge and experience in the weeks and months leading up to the event. In particular, his plan for the extremely compact layout of registration, start, map exchange and finish, helped to simplify organisation. As well as Paul and Duncan, controller and planner respectively, I can’t thank my fellow members of SLOW enough for their help on the day, especially the registration team who coped admirably in the early rush. It was my fault that this was not arranged better, particularly on the bib collection for blood races, which lead to the delay on the start. Congratulations to our champions, due to the weather most people headed off before we had a chance to collate the results. We will endeavour to get trophies and coasters to winners as soon as possible. Thanks to everyone who came to Richmond Park despite the wintry conditions. As a relatively novice planner it was encouraging to see so many people speaking positively of the looped format of the blood races since it was fun but challenging to plan. Controller Paul was able to come up with an algorithm for allocating correct maps to each competitor and creating the variation and with Andy and Steve managed to come up with the assembly field layout so I am indebted to them for making the courses work. As well as thanking all the volunteers who helped put out and take in controls, I would like to single out Andy Robinson who has been a stalwart of SLOW and who we relied on heavily for the planning and delivery of this event. Also a considerable amount of publicity for the event was created through a promotional video. It was made by Katherine Bett of Southern Navigators and features SLOW member Ralph Street and GB team colleague Alasdair McLeod. This hopefully provides a benchmark for future events! From my point of view it was great to see the wide range of competitors on the blood courses – from university students giving it a try for the first time to English and British Internationalists Ben Windsor and Tessa Strain respectively topping the male and female results. 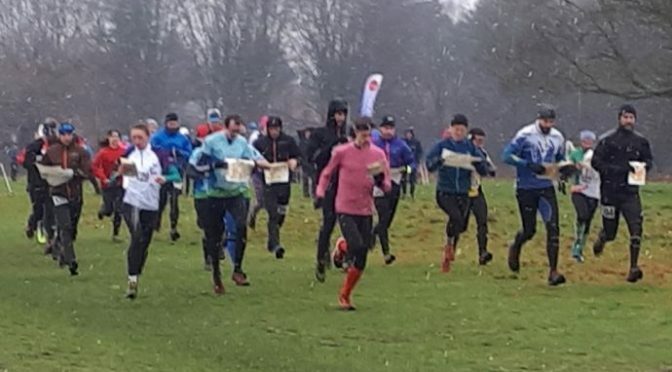 Today’s races in Richmond Park saw testing distances, and testing conditions for competitors and officials alike. The forecast was for it to start raining at 9am, and carry on throughout the event. And it did just that, with the rain turning to sleet at times. We’ve got quite a lot of kit drying at the moment – you too? We hope you all had a good time, especially our many newcomers – thanks for coming, and you do know every event is different don’t you – it’s not always like this. Illness kept some away, and the weather no doubt induced some to think “you know what, I think I’ll give it a miss today.” Still, you that came experienced pretty good running conditions, if pretty unpleasant conditions for doing most everything else. And of course you ran in Richmond Park, always lovely, and many of you enjoyed a bit of special “buzz” from the mass-start format. Congratulations to all finishers, and commiserations to others. On behalf of South London Orienteers’ I extend particular thanks to the three main event officials. We were very lucky to have Paul Todd of London OK as an extremely hard-working and skilled controller. He was a full member of the team that designed and prepared the event. Then on the day he arrived with the first helpers, he checked things, he put out controls, he checked all the controls, he collected controls, he did plenty of things in between, and then he was there until the end helping to check the SI boxes and hire dibbers were ready for a future event. The planner was Duncan Grassie, of South London Orienteers and Auld Reekie Orienteering Society. Most of his work was beforehand: the course design, selecting, checking and tagging control sites, and preparing the maps. The park is not the most complex terrain but I understand all courses included a good range of challenges, and the clever “gaffling” system that Duncan and Paul chose seemed to work very well from the comments of finshers. And as our Chairman said, some might have baulked at spending the day before they fly to Dubai for work, out all day in the Park, managing the controls and courses, but someone not only did all that, mostly in pouring rain, but then was offering to do plenty of other things that evening to sort things out for the next races – the first of which is Tuesday evening incidentally. Everything prior to, during, and after the actual races; not just between the start and finish. The safety & welfare of participants and members of the public in the event area including the completion of a risk assessment, risk management and contingency plans. Land permission, event registration, access, car parking, assembly area, volunteer helpers, publicity timescales. The equipment used including electronic punching, clocks etc. It was Steve who, towards the end of the day, as he contemplated loading his car with a whole load of wet equipment (and his flat is on the 3rd floor) suggested the conditions might well justify the above phrase “you know what, I think I’ll give it a miss today.” Thanks for only thinking that Steve. Steve briefs the “Very Nearly An Armful” runners, Andy is nearby on the right of the picture, and Paul watches on the left.